My theory about Inception (that it’s actually Dom Cobb [Leonardo DiCaprio] who is the subject of the inception) was fun to concoct, and I think it’s pretty well argued, but it’s also a fact that I’m not a fan of “deciphering” movies, or for that matter of films that need to be deciphered. (This may also be why I never got into Lost.) I mean, who’d want to reduce what is ostensibly a work of art to the level of a puzzle? I love Blade Runner, but my eyes kind of glaze over whenever discussion of that disintegrates down to questions of Deckard’s being a replicant or whatever. But Inception is so much more than that, to me. For starters, I can’t think of many Hollywood blockbusters that are this sad. As befits its central theme, the film is suffused with regret. But beyond regret, there’s a certain loneliness that seems to haunt Cobb: Almost every scene winds up isolating him in some way -- be it in dreams or in the ostensible real world, by choice or by circumstance. Even during some of the film’s more suspenseful scenes, we can’t seem to shake off this sense of melancholy and solitude. 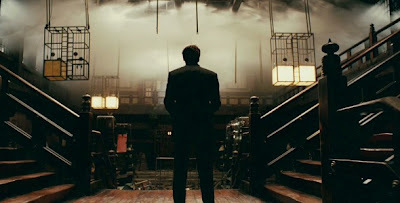 Think back to how the dream at the beginning seems to finally collapse on him: That image of him at the center of Saito’s dream palace as it caves in, being engulfed by water – it’s not just a climactic finale to the film’s opening sequence but also a concise visual summation of pretty much the entire movie. Obviously, though, in Inception, there are other people there, since we’re talking about shared dreams. In fact, the film manages to have its cake and eat it, too, insofar as it also privileges each of its supporting characters with at least one big scene of their own, usually isolating them in their own respective dream – an elegant structural gambit, if nothing else. But each dream gravitates toward solitude and chaos, and Cobb always seems particularly alone, always isolated, always stuck inside his own head. When he introduces Ariadne (Ellen Page) to the dream world and they wander through Paris, Nolan blocks the scene in a way that always keeps the two apart, one character constantly trying to catch up to the other. Cobb seems almost lumbering, carrying a heavy burden, while Ariadne seems light as a feather. It helps, of course, that Ellen Page appears to be the size of a salt shaker. I’m not saying anything earth-shaking here. Nolan seems to be one of those guys who can take the requirements of a typical Hollywood blockbuster and turn it into something genuinely personal. His mind just works in that way, it seems. He’s made a number of movies about characters who knowingly isolate themselves from the world, not just because they have to (because they’re superheroes or amnesiacs or magicians or whatever) but also because they have some sense of shame and guilt; their isolation also serves as a kind of penance and self-denial. Which brings me to another reason why I found myself so taken with Inception: Its notion that in our dreams we tell ourselves the things we need to hear. The final, lengthy confrontation between Mal and Cobb, with its almost kaleidoscopic arpeggios of flashbacks, is, ultimately, just a man talking to himself deep inside his subconscious; Cobb talking to his own projection of his dead wife. When he tells Mal that they grew old together in their dreams, that they had their time together, and that she forgot this, what he’s really doing is reminding himself of all these things, saying something to his own mind that he could never accept in the real world.